Ideology: Do the Polls Match America? Most major polls over the last few months have painted a picture of an American voting public that is predominantly conservative. Before we dig into the polls that have come out recently, let's look at historical data to get some context for what one might expect the ideological makeup of the American electorate to look like. First, let's look at the brilliant post this week from Pew Research Center by Michael J. Robinson, entitled "A Static America: A Contrarian View of Current U.S. Public Opinion Trends," showing data going back to the 80s indicating that America has been remarkably stable in terms of ideology. The line, going from 1987 to the present, barely wiggles as it traces American ideology over the course of the decades. Americans may change their voting behavior, sure, but ideology is much stickier than the pundits give it credit for. Let's also take a look at the exit polls. At the House level, the exit polls have shown that moderates have outnumbered conservatives -- and by considerable margins -- in every election since at least 1984. In fact, even in 1994, when the Gingrich revolution swept a wave of conservative members into Congress, moderates still outnumbered conservatives. 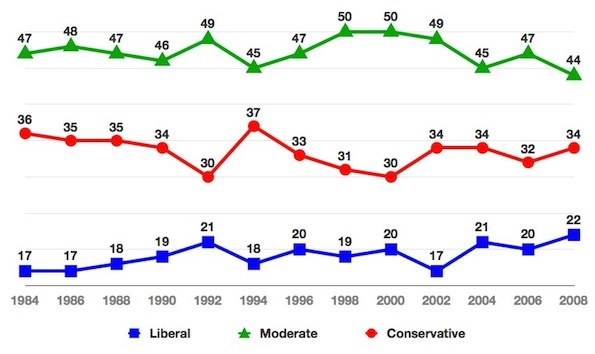 Sure, the gap closed significantly from the 1992 election, but we still did not see the number of conservatives even reaching parity with moderates, much less exceeding them. We've now established the context. The electorate has had more moderates than conservatives, and even in years that were extremely good for Republicans, the closest conservatives ever came to parity was still 37% conservative to 45% moderate. The Robinson piece further underscores the stability of ideology in the electorate. Why then are so many of our public polls showing samples with an ideological makeup that looks nothing like this, with conservatives outnumbering moderates? One egregious recent example is the AP/GfK poll that thrilled Republicans with a generic ballot advantage of +10 among likely voters. Yet look at their sample; the sample of adults was 22% liberal, 31% moderate, and 45% conservative. And as Alan Abramowitz wrote on Pollster.com just a few weeks ago, this year has shown an increasingly large gap favoring Republicans as you narrow a sample down to "likely voters," which gives me serious doubts that the likely voter sample would be less heavily conservative than the overall adult sample. Let's look at another major poll that had Republicans breaking out the champagne. In early September , an ABC News/Washington Post poll generated excited cheers from Republicans when its likely voter sample showed +13 for Republicans on the generic ballot. They don't release the ideological breakdown of their likely voter sample, but their overall sample of adults shows 40% conservative, 37% moderate, and 19% liberal. One can only speculate as to how much more conservative the "likely voter" subsample is. The mid-September CBS/NYT poll of adults gets it closer, with 36% conservative and 40% moderate. Among "likely voters" they give Republicans a +2 advantage on the generic ballot, but we don't know what the partisan or ideological makeup of that subsample is. Again, likely voter screens tend to be more favorable to Republicans this year, and it is unlikely that the likely voter universe is less conservative than the adults universe. The most recent NBC/WSJ also gets it around that range with their sample of adults, with 37% moderate and 39% conservative. However, remember, this is adults -- not registered or likely voters -- and yet conservative is still outnumbering moderate. A recent POLITICO-GWU Battleground poll of likely voters showed 63% of their sample considering themselves conservative (curiously, "moderate" was not even offered as an option). All of which poses a very serious question that has major implications for how on (or off) the mark these polls are: Are pollsters these days surveying too many conservatives? Despite decades of evidence to show that ideology is fairly consistent, it wouldn't be completely out of the blue for conservatives to make an enormous gain over the 2008 electoral makeup. Between 1992 and 1994, the proportion of the electorate that was conservative did jump 7 points from 30% to 37%. If that occurred again, you'd wind up with 41% conservative (a 7-point jump from the 34% in 2008). Depending on how much of that jump peeled away from the moderate number, you could feasibly have more conservatives turn out than moderates or liberals. But that's a big "if." This isn't to say that pollsters with very heavily conservative samples are wrong. It isn't out of the realm of possibility that a massive structural change is occurring in the American electorate this year that has conservatives making a massive jump -- so massive as to eclipse that of 1994. But what it does say to me, as a Republican, is that we ought to stop dancing in the end zone before we've scored a touchdown. It tells me that two-and-a-half decades of data show things aren't as wobbly as they seem, that the electorate doesn't change its ideological makeup radically, and that polls with more conservatives than moderates just might be painting a rosier picture than we all might find ourselves looking at on election day. Just as pollsters ought to get in the habit of releasing the partisan makeup of their samples, including their subsamples of registered and likely voters, they also ought to release the ideological breakdown. As a consumers of political data, we have a right to make informed decisions about whether or not a poll is sampling conservatives more heavily than we think it should. When election day rolls around, and I update that ideology chart above, I may well find that red line for "conservatives" intersects and crosses over the green line for "moderates." But I'm not confident that's going to happen. I think everyone ought to seriously consider the ideological makeup of survey samples when weighing how much stock to put in the results they produce.